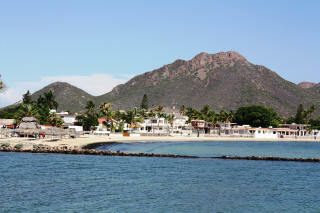 San Carlos is surrounded by miles of beautiful beaches and each has its own special attractions. There are all different kinds: noisy, quiet, secluded, crowded, sandy, or rocky. All the beaches in Mexico are open to the public, but in a few places, you can’t get to the beach because a private home or a hotel blocks the way. A few nice beaches can only be reached by boat. Nevertheless, there are still miles and miles of beaches that are easy to reach. Some are sheltered from the afternoon winds which prevail in the winter. That means they are sheltered on the north side. Some are sheltered from the afternoon winds from the south which prevail in the summer. The best times to visit the beach are mornings before the winds come up, which usually start between noon and 3:00 PM. The winds subside at sunset, and that is a lovely time to visit the beach or the marina and watch the sun go down. Some beaches are big enough for a party with lots of room for parking. Some beaches are tucked inside small coves, called “calletas.” The beaches in these calletas are more intimate in size and usually offer more privacy and protection from the wind. On empty beaches such as Playa del Sol beach, Cochorit beach and sometimes in San Carlos, beware of sting rays and jellyfish. The rays rarely bother a person unless they are taken by surprise. The overwhelming majority of stingray injuries occur when a person steps on one, or when a diver sticks their hand in a crevice where one is hiding. ALWAYS shuffle your feet as you walk in the water to announce your presence. It is a good idea to wear "reef walkers" or other water shoes, or even an old pair of canvas tennis shoes when you are playing in the shallow water; they provide only minimal protection from being stung, but they are a reminder to scuff your feet along the bottom as you walk along. If someone is stung or cut by a ray, seek medical attention immediately (see Staying Healthy for more information). In San Carlos, a good place to seek emergency treatment is at Rescate or one of the local doctors for treatment. 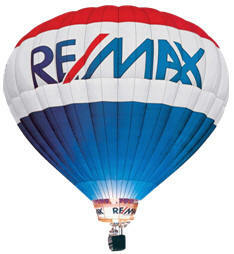 (Rescate is located across the street from the OXXO next to the Remax office). Jellyfish are only a problem in warm water, usually in the summer time, extending into early fall. You should keep your eyes open for their pretty watery blue floats (like a lopsided bubble) floating on the surface of the water. If you see jellyfish in the water, or if you run into pieces of tentacle, get out of the water. Children especially are sensitive to being stung. Jellyfish that wash up on shore are still poisonous, even after they are dead. They are more likely to be seen on the beach when winds are on-shore. Make sure your kids know not to step on them. Some of the worst stings we've seen have been on kids that tried to stomp on the bladders or pick one up. The jellyfish bodies disintegrate quickly when they die, but unfortunately, the stinging cells (nematocysts) don't. If you are swimming in the water, you may feel a painful "zing" if one of these touches your skin. It's painful, but a single sting fades fairly quickly. If someone gets tangled up in jellyfish tentacles, see Chapter 10 for more information on treating the injuries. Nidaria Technologies has recently come out with a product called "SafeSea," which combines jellyfish sting prevention with sun block. It is not specifically formulated for man o'war, but its effectiveness appears to be good to excellent. It runs about 12-14 dollars, and is available in dive shops or over the internet. The most private as well as the most beautiful beaches are only accessible by boat. (See section on Best Anchorages). But, many good beaches can be reached by car and are only a short walk from the parking area. Beaches in Mexico are public property and are considered to be in a Federal Zone. There are many public access sites, but it is improper to access beaches by using private property or hotel property. 2. La Posade Beach near La Posada Condominios. 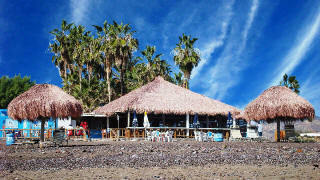 You can reach this beach by way of the paved road to Condominios Pilar and Bahia Delfin, just off the Scenic Highway. This is a famous shell beach. It is a long, sandy beach with cream-colored sand, pretty shells and good swimming. The section in front of Pilar Condos is well tended by the Pilar Condo staff. The waters at this beach and Cochorit seem to be the only ones with soft, sandy bottoms. San Francisco Beach has a protected cove and is pretty and comfortable enough to spend the day there. We went there with some women on vacation on a very warm day. They enjoyed the water so much that they wouldn’t come out of the water until long after the sun set! This beach can be accessed easily from the Scenic Highway. At the La Posada Condominium sign, turn toward the water and drive up to the parking lot. You will see a sign on the left (east) side of the road pointing to the La Posada Condos . The beach here has a pebbly bottom, so it is good, but not perfect for swimmers. The best thing about La Posada beach is its protected location and long strip of firm sand for walking the beach. Stop in and have lunch at Pasada Restaurant. (Formerly occupied by the Shangri-La Trailer Park) This beach is a small, protected, well-groomed, but rocky beach with chairs and lounges but the beach is for anyone. To get there, take the main highway all the way to the dead end at the Frutería grocery, turn left, and drive on the red brick road to the end (about 300 yards). When you survey the view from Mirador Escénico (Scenic Lookout), you will notice the pretty turquoise waters of Calleta Lalo and the Anegado Lalo Reef on the left at the base of the lookout. About 3 1/2 miles north of the center of San Carlos, just before you reach the Mirador Escénico , you will pass this little cove, sometimes called Frenchy’s Cove . It is a favorite seascape view for local artists. You can reach this by a footpath from the Mirador, or by car from the road. To reach this beach, turn left before reaching the gates to Mirador, drive down a dirt road to the first beach of a string of little coves and sandy beaches The first little beach is called Piedras Pintas (Speckled Rocks). There is. plenty of room for parking cars or RV’s. This small cozy pebble beach, about four miles long, is sheltered from the wind. After you turn in, drive .4 mile to the left to reach the nicest part of the beach. This is an excellent place to spend the morning playing and picnicking. Some of the best tide pools are at Playa Piedras Pintas . Swimming and snorkeling are also very good. It's a favorite place for sail boarding, small sailboats, and kayaks. Fishing for triggerfish is usually good here. No shade on this beach. Garbage is under fair control. It’s nice for evening campfires, but overnight camping is not permitted on this beach. Don’t attempt to drive this dirt road during a rainy spell. Even two or three weeks after a heavy rain the roads are muddy and your car will get probably get stuck. Why is it called Algodones” which means “cotton”? Some say it’s because it is white; others claim it’s because the sand is soft as cotton. It is the smoothest and the whitest beach in San Carlos. 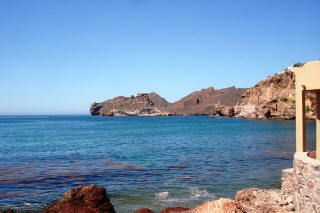 Algodones beach is 6 miles from the center of San Carlos. To get there, take the Scenic Highway to Paradiso Resort & Beach Club (Old Club Med). A half mile before reaching Paradiso, turn left toward the beach. There are several dirt roads that give access to the beach. 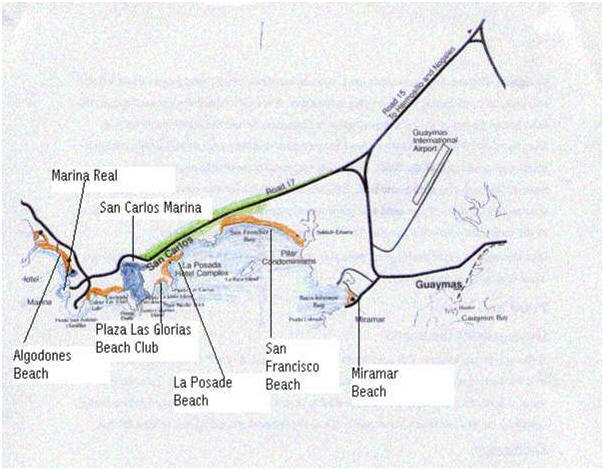 The beach extends a few miles on both sides of San Carlos Plaza Hotel and runs for several miles up to Paradiso and beyond. This is a beautiful beach with soft sand dunes. However it can get trashy, tends to be windy, and signs posted there warn against swimming because of the undertow. The section of Algodones in front of Plaza San Carlos Hotel is kept very clean, and the soft, fine sand invites you to sit, sleep or daydream all day long under the palapa. The next stretch of Algodones Beach is called the Catch 22 Beach because of the movie that was filmed there in the early ‘70’s. 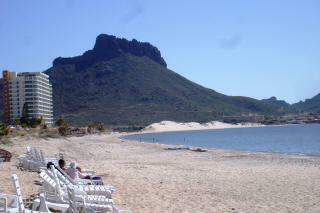 On Algodones beach, the beach just beyond Paradiso is one of the prettiest beaches in this area. It has a particularly beautiful view. The sand dunes in this area are especially nice, clean and private, but it tends to be windy. Overnight camping is allowed there. 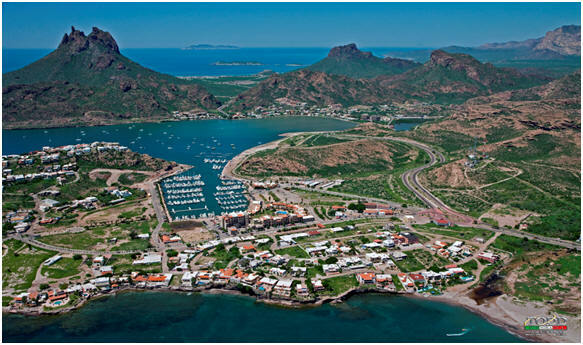 In the suburb of Miramar, between San Carlos and Guaymas, there is a popular beach, busy on weekends with volleyball, pedal boats, kayaks, lots of kids and teens, music, and a beer and taco restaurant. You can rent banana boats, pedal boats, inner tubes, etc. on the beach. 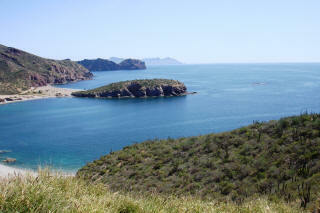 To get there, go to the suburb of Miramar located between San Carlos and Guaymas. Turn right before the overpass bridge where the sign points to Miramar and continue to the end of the road (1 mile). Drive down a short residential street to the beach. Dirt parking lot. This natural and unpopulated beach is a little south of Empalme, not a long drive from here. Drive through Empalme, past the La Cobacha Restaurant. When you get to the La Cobacha, turn right on the first paved road and drive less than a mile to the beach. It is usually unpopulated, but can be extremely crowded during spring and summer holidays such as Semana Santa. The beach goes on for miles and is a sure bet for shell collectors. Shell collecting is best at low tide after a big storm has washed the shells ashore. Lowest tides occur in the winter months at the full moon and the new moon. Playa del Sol is a little farther from San Carlos than Cochorit and is even more isolated than Cochorit. Drive south on Highway 15. At Kilometer 113, turn right on a dirt road and go about 2 miles to the beach. Beware of the sting rays. ALWAYS shuffle the sand with your feet when walking in the water. Most of the visitors to San Carlos in the summer enjoy swimming in the warm, clear ocean, but they also enjoy the swimming pools. In fact, beginning snorkelers go to the swimming pools for practice. The hotel swimming pools in San Carlos are reserved for hotel guests, but there are three very nice pools open to the public for a reasonable fee. 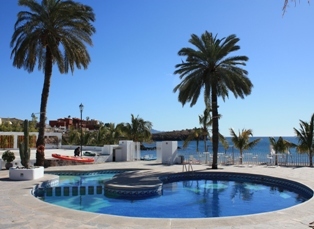 San Carlos Plaza Hotel has a large, beautifully landscaped pool with a kiddies’ pool, slide, a hot tub, and a palapa where food and drinks are served. This pool is for hotel guests. The beach in front of the hotel is a lovely, clean beach which is part of the Algodones Beach and is open to the public. Gymnasio Verde is a gym club with an Olympic size lap pool and a kiddy pool. Memberships are sold by the day, month, or season. Members are entitled to use of the workout facilities as well as the pools. Take the del Mar Road, turning north at Hambone Insurance. It goes through a rural area called Ranchitos. There is a new gym with a heated pool located at the Athletic Club. It is located on Calle IV in the Ranchitos, turn north at the 1st Extra (a convenience store) that you come to when entering into San Carlos. The gym is on the left side of that street. MarinaTerra Hotel This centrally located hotel has two swimming pools for hotel and condominium guests. However, you can buy a yearly or daily membership that will allow you usage of the pool at the hotel and the amenities at the Beach club. Ask at the Hotel for details. Rates are subject to change. The beautiful Beach Club (El Club de Playa) offers the guests a clean beach with beach umbrellas, and a large, shady palapa with tables and chairs, a dance floor. The beach is located in front of Shangri-La Cove (the site of the old Shangri-La Trailer Park). On either side of the Club there is a sandy beach a short walk from the parking lot. This area, like all beaches in Mexico, is open to the public. The Shangri-La cove is excellent for snorkeling, tide pool exploration, and kayaking.